Antonio Ramiro "Tony" Romo (born April 21, 1980) is an American football quarterback for the Dallas Cowboys of the National Football League (NFL). He played college football for Eastern Illinois University. At Eastern Illinois, Romo won the Walter Payton Award in 2002, and led the Panthers football team to an Ohio Valley Conference championship in 2001. Not selected in the 2003 NFL Draft, Romo signed as a free agent with the Dallas Cowboys. 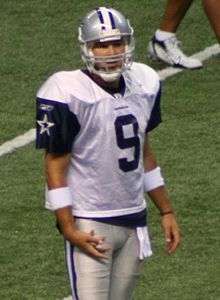 After two seasons as a holder, Romo replaced the Cowboys' previous starting quarterback Drew Bledsoe during a game against the New York Giants in the 2006 season. Romo was a Pro Bowl selection for the 2006, 2007, 2009 and 2014 seasons, all seasons in which the Dallas Cowboys made the playoffs. He has also broken Dallas Cowboys team records including most games with at least 300 passing yards and games with three or more touchdown passes. However, Romo has also been noted for a lack of postseason success and to date, has won only two of the six playoff games he played in. Since 2006, Tony Romo has a higher passer rating in the 4th quarter than any other NFL quarterback. Romo was born in San Diego, California, while his father, Ramiro Romo, Jr., was serving in the United States Navy, and his mother, Joan (Jakubowski) Romo, was a store clerk. His family returned to their home in Burlington, Wisconsin. Romo played baseball as a child and was selected to the Little League All-Star team. Romo started as quarterback for the Burlington High School Demons beginning as a junior (1996 season). In the 1997 season, Romo and the Demons finished with a 3–6 record, though he earned several honors, including the All-Racine County football team and Wisconsin Football Coaches Association All-State first team honors. Romo also was a starter on the BHS varsity basketball team and also played golf and tennis. Romo graduated from Burlington High in 1998. Romo attended Eastern Illinois University in Charleston, Illinois, where he played for the NCAA Division I-AA Eastern Illinois Panthers football team. As a sophomore in 2000, he ranked second in Division I-AA in passing efficiency, completing 164 of 278 (59%) passes for 2,583 yards and 27 touchdowns. After the season, he was honored as an All-America honorable mention, an All-Ohio Valley Conference member, and the OVC Player of the Year. As a junior, he led Division I-AA in passing efficiency, completing 138-of-207 passes for 2,068 yards and 21 touchdowns. Romo earned OVC Player of the Week honors on October 14, 2002 after his eight-yard scramble run on the last play of the game led Eastern Illinois to a 25-24 win over Eastern Kentucky. On December 19, 2002, Romo became the first player in Eastern Illinois and Ohio Valley Conference history to win the Walter Payton Award, given annually to the top Division I-AA football player. He finished his career holding school and conference records with 85 touchdown passes. He was second in school and third in conference history with 8,212 passing yards and second in school history with 584 completions and 941 attempts. As a senior, he set school and conference records for completions with 258 in 407 attempts for 3,418 yards. This was second in conference and third in school history for a season. He threw for 34 touchdowns and scored one rushing touchdown. Romo's 3,149 yards in total offense as a senior ranked third in school and conference history. Along with the Walter Payton Award, Romo earned consensus All-America honors. He was also selected All-Ohio Valley Conference and was named OVC Player of the Year for the third straight year. Romo attended the 2003 NFL Combine. Despite intriguing some scouts, he went undrafted by any NFL team during the 2003 NFL Draft. Throughout the draft, Romo was assured by Sean Payton of the Cowboys' interest (Romo was also intensely pursued by former Denver Broncos head coach Mike Shanahan), and shortly afterwards was signed as an undrafted rookie free agent by the Cowboys. Romo entered the 2003 training camp third on the Cowboys' depth chart behind Quincy Carter and Chad Hutchinson. In 2004, the Cowboys released quarterback Chad Hutchinson and signed veteran quarterback Vinny Testaverde and traded a third round draft pick to the Houston Texans for quarterback Drew Henson. Romo faced being cut from the roster until Quincy Carter was released following allegations of substance abuse. Throughout 2004 and 2005, Romo served as the holder for placekicks. After Vinny Testaverde's tenure in Dallas ended in 2005, the Cowboys signed veteran quarterback Drew Bledsoe, the eighth starting quarterback for the Cowboys since 2000. One of Romo's early career highlights was in 2004, when (as the third string QB) he rushed for the winning touchdown with six seconds left in a preseason game against the Oakland Raiders. Elevated to the Cowboys' #2 quarterback in 2005, Romo had strong showings in the 2005 and 2006 pre-seasons. In the 2006 off-season, Sean Payton (now head coach of the New Orleans Saints), offered a third round draft pick for Romo, but Jerry Jones refused, asking for no less than a second round draft pick. Romo eventually took over the first-string quarterback role from Drew Bledsoe during half time against the New York Giants on October 23, 2006. Romo began the season as a backup to starter Drew Bledsoe. He took his first regular season snap at quarterback in a home game against the Houston Texans on October 15. His first NFL pass was a 33-yard completion to Sam Hurd. His only other pass of the game was a two-yard touchdown pass, his first in the NFL, to Terrell Owens. One week later on October 23, 2006, Romo replaced Drew Bledsoe for the start of the second half of a game against the New York Giants. His first pass was tipped and intercepted. His game stats in only his second NFL appearance were: 14 completions on 25 attempts for 227 yards, two touchdowns, and three interceptions (one of which was returned for a touchdown). On October 25, Cowboys head coach Bill Parcells announced that Romo would be the Cowboys starting quarterback for the October 29 game against the Carolina Panthers on NBC Sunday Night Football, in Week 8 of the 2006 season. Romo led the Cowboys to victory in his first game as a starter, 35–14. In that game, Romo was Sunday Night Football's "Rock Star of the Game." On November 19, 2006, Romo led the Cowboys past the Indianapolis Colts, the NFL's last unbeaten team. Romo completed 19 of 23 passes as the Cowboys won against the Colts 21–14. Four days later he helped the Cowboys win in a Thanksgiving Day game against the Tampa Bay Buccaneers by the score of 38–10. Romo went 22-29 with 306 yards and five touchdown passes and no interceptions. For his performance, he was awarded FOX's Galloping Gobbler award as the Thanksgiving Day MVP. Romo aided the Cowboys in clinching a playoff spot, the second since Parcells became coach in 2003. He concluded the 2006 regular season with 220 completions on 337 pass attempts for 2,903 yards, 19 touchdowns, and 13 interceptions, with a passer rating of 95.1. Romo played in the 2007 Pro Bowl after Drew Brees went down with an elbow injury as a substitution for Marc Bulger. Romo threw one touchdown and one interception. Romo was the NFC's kickoff holder in the game. Romo began the 2007 season with four touchdown passes and an additional touchdown rush, the first of his career, defeating the New York Giants 45–35 in the Cowboys' first game of the regular season, His 345 passing yards in Week 1 led the NFL. In Week 2, Romo threw for 186 yards and two touchdowns beating the Miami Dolphins, ranking him seventh in passing yards and tied for second with six touchdown passes. Romo added 329 passing yards and two touchdown passes in the Cowboys' Week 3 34–10 win over the Chicago Bears. The following week, he passed for 339 yards and three touchdowns in a 35–7 win over the St. Louis Rams. He also ran for an additional touchdown. This brought his season totals to 1199 passing yards with 11 passing touchdowns and two rushing touchdowns. In Week 5 of the season on Monday Night Football against the Buffalo Bills, Romo threw five interceptions (four in the first half, two of which were returned for touchdowns) and lost a fumble. He became the second person in the history of Monday Night Football to throw five interceptions in a winning effort. The first person was his QB coach Wade Wilson. Nonetheless, he threw for 4,211 yards (third in the NFL) and 36 touchdown passes during the regular season (second only to Tom Brady). His 97.4 passer rating was good enough for fifth in the NFL behind Tom Brady, Ben Roethlisberger, David Garrard, and Peyton Manning. On November 29 against the Green Bay Packers, in a game between 10–1 teams, Romo threw four touchdown passes (bringing his season total to 33), breaking Danny White's (29) record from 1983. On December 22 against the Carolina Panthers, Romo became the first Cowboys' quarterback to pass for more than 4,000 yards in a season. Finally on December 30 against the Washington Redskins, Romo broke the Cowboys' season completions record with his 335th completion, a short pass to Jason Witten. The Cowboys finished the season with a 13-3 record. In the Cowboys' January 13, 2008 Division playoff game against the New York Giants, Romo was unable to lead his team to a come-from-behind victory. On 4th down with less than half a minute and no timeouts left, Romo threw the ball into the endzone, but it was intercepted by Giants cornerback R. W. McQuarters, ensuring that the Cowboys were eliminated from the playoffs with a 17–21 loss to the eventual Super Bowl champion Giants. On September 7, 2008, Romo led the Cowboys to a 28–10 win over the Cleveland Browns in their season opener. Romo completed 24 of his 32 passes for a total of 320 yards and one touchdown. After the game, Romo required 13 stitches for a large gash on his chin that occurred during the third quarter when linebacker Willie McGinest hit Romo in the chin with his helmet. The NFL fined McGinest $7,500 for the hit. On September 15, 2008, Romo led the Dallas Cowboys to a 41–37 win against the Philadelphia Eagles in the second game of the 2008 season. Romo completed 21 of his 30 passes for a total of 312 yards and three touchdowns. The 54 combined points scored by the Cowboys and Eagles in the first half were the second most scored in a half during a Monday Night Football game. Romo and the Cowboys would win their third straight before losing to the Washington Redskins, falling to 3–1. Following a win against the Cincinnati Bengals, Romo was injured in a loss to the Arizona Cardinals. The Cowboys, under Brad Johnson, went 1–2 the next three games, falling to the St. Louis Rams, beating the Tampa Bay Buccaneers, and losing to the New York Giants. In what became a de facto third playoff game for Romo shortly prior to its start, on December 28, 2008, Romo and the Cowboys failed to compete against the Philadelphia Eagles in a 44–6 loss. Romo committed three turnovers in the game and went 21/39 for 183 yards and no touchdowns. The loss dropped Romo's combined record in December to 5–8 and again raised questions concerning Romo's performance in games of consequence. Romo led the Cowboys to a 34–21 win over the Tampa Bay Buccaneers in their season opener. Romo completed 16 of his 27 passes for a then-career high 353 yards along with three touchdowns. In a December road game against the division rival New York Giants, Romo passed for a career high 392 yards, along with three touchdown passes in a losing effort. In week 15, Romo led the Cowboys to a win against an undefeated team late in the season for the second time in his career. In 2006, he won against the 10-0 Colts, and on 19 December 2009, he defeated the 13-0 Saints at New Orleans, throwing for 312 yards, one touchdown and no interceptions. Romo finished the 2009 season as the first quarterback in team history to take every snap for a full season. He also passed his own mark for single season passing yardage, with 4,483 yards, and became the first Cowboys quarterback to throw 20+ touchdowns and less than ten interceptions in a season. His eight 300 yard games was also a team record, surpassing his own record from 2007. His 1.6% interception percentage tied a team record, and his career interception percentage is now the lowest in franchise history. Romo had a 104.9 passer rating in a 34-14 win of the Philadelphia Eagles in the first round of the playoffs, earning the first play-off win in 13 years for the Dallas Cowboys, and his own first career post-season win. However the following week in the NFC divisional rounds against the number two seed Minnesota Vikings, Romo had three fumbles (losing two), an interception and was sacked six times in the 34-3 loss. In Week 5 against the Tennessee Titans, Romo threw for a career-high 406 yards and three touchdowns. However, he threw two costly interceptions in the 4th quarter, resulting in 34-27 loss at Cowboys Stadium. Romo and the Cowboys were desperate for a win with a record of 1-3 and last in the division. They played against the Minnesota Vikings, who also had a 1-3 record and were in need of a win. Romo threw for over 200 yards and 3 TDs but also threw 2 costly interceptions. The Cowboys went on to lose the game by a score of 24-21. During the October 25, 2010 Monday Night Football game against the New York Giants, Romo suffered a broken left clavicle. The injury occurred during the second quarter, when Romo was driven to the turf by Giants linebacker Michael Boley. He was placed on Injured Reserve on December 21, 2010 and replaced by veteran Jon Kitna. Romo finished the 2011 season with 346 completions on 522 attempts (66.3%) for 4,184 yards 31 touchdowns and 10 interceptions for a QB rating of 102.5 in 16 starts. His 102.5 QB rating was good for fourth best in the league behind the National League MVP Aaron Rodgers, Offensive Player of the Year Drew Brees and AFC Champion Tom Brady and second highest in Cowboys history. His 66.3 pass completion percentage was 3rd in the league behind Rodgers and Brees. His 4,184 yards ranked as third highest in team history behind his 2009 and 2007 records. Romo also added 46 rushing yards and one rushing touchdown with three lost fumbles and was sacked a career-high 36 times. Half of Romo's interceptions for the season occurred in the first four games of the season and for the final 12 games Romo threw 24 touchdowns to just five interceptions. Romo had four fourth-quarter comebacks in 2011 (49ers, Redskins twice and against the Dolphins) and had a would-be game winning field goal attempt against the Cardinals and a would-be game-tying field goal attempt against the Giants both blocked (The Cowboys would go on to lose both of those games). In Week 2 against the San Francisco 49ers (who would later go on to the NFC Championship), Romo suffered a broken rib and a punctured lung on a hit from Carlos Rogers in the second quarter that forced him to miss part of the game. In this game, rookie kicker Dan Bailey missed a 21-yard field goal that would prove to be crucial at the end of the game. Romo came back in the final seconds of the 3rd quarter and played the fourth quarter throwing for a touchdown and driving down the field for the game-tying field goal with four seconds left in the game to force overtime. The 49ers won the coin toss and elected to receive the ball. The Cowboys defense forced the punt and Romo started the drive at their 22-yard line. On the first offensive possession for the Cowboys in overtime, Romo connected with Jesse Holley for 77 yards to set up the 19 yard game-winning field goal. Romo finished the game with 345 yards and two touchdowns with a 116.4 rating despite the cracked rib and punctured lung. For his performance in this game, Romo earned the NFC's Offensive player of the Week Award. Romo played the rest of the season with the cracked rib and used a protective vest for a few games to protect his torso. Against the eventual AFC Champion New England Patriots in Week 6, Romo completed 27 of his 41 passes for 317 yards with one touchdown and one interception at Gillette Stadium. The Cowboys held a three-point lead with 2:31 left in the 4th quarter before the Cowboys’ defense surrendered 80 yards in ten plays to Tom Brady (8 of nine passing in the final drive) for the game-winning touchdown with 27 seconds left in the game. In Week 10, Romo posted the second highest QB rating of his career with a rating of 148.40 (in a Thanksgiving game on 11/23/06 Romo posted a rating of 148.90 going 22 of 29, 306 yards and 5 touchdowns). In the win against the Buffalo Bills, Romo was 23 of 26 for 270 yards and three touchdowns with no interceptions. In Week 14 against the eventual Super Bowl champion Giants, Romo had 21 completions out of 31 passes (two spikes) for 321 yards, four touchdowns and no interceptions. Romo had his second highest QB rating of the season with a rating of 141.30. In one of the more memorable plays of the season, with 2:25 left in the game and the Cowboys leading 34 to 29, on 3rd down with five yards to go, Romo overthrew Miles Austin for a wide open pass on a "go" route (though the injured Austin later admitted to "losing" the ball in the stadium lights). The Cowboys punted from their 25-yard line after the incomplete pass. The Giants got the ball back at their 42-yard line with 2:12 in the game. The Giants marched down 58 yards in 8 plays for the touchdown, leaving just 51 seconds left in the game. With 46 seconds left in the game, and down by three points, Romo and the offense advanced 51 yards in 40 seconds and five plays (three passes and two "spikes") from their own 20-yard line to the Giants 29-yard line stopping the clock with six seconds left in the game and setting up a game tying 47-yard field goal try. The Giants' Jason Pierre-Paul blocked the field goal and robbed the Cowboys of the opportunity for the win in overtime that would have made it very difficult for the Giants to advance to the playoffs. Romo had the highest quarterback rating (141.3) in a losing effort of any signal-caller for the 2011 season. In Week 16 against the Eagles, Romo suffered a severely bruised hand when he smashed it against an opposing player's helmet. Romo left this game after attempting just two passes with no completions. The next week, in the season finale at Metlife Stadium against the Giants, the winner between the Cowboys and Giants would take the NFC East title and a spot in the playoffs, while the loser would be eliminated from playoff contention. Romo started the game despite the hand injury the previous week. Romo posted 29 out of 37 passing for 289 yards, two touchdowns and one interception for a 106.0 QB rating and a 78% pass completion rate (second highest of the season) as the Cowboys lost the game 31-14, dropped to an 8-8 record and were eliminated from playoff contention. The Cowboys went 5-0 for the season when rookie running back DeMarco Murray received 20+ touches in the game and 2-5 when he did not. In the five games where Murray got 20 or more touches, Romo averaged a passer rating of 112.10, 246.60 yards per game, along with 12 combined touchdown passes with two interceptions and a 66.99% pass completion rate. The Cowboys established a new franchise low in rushing touchdowns in the 2011 season with five, which included a rushing TD by Romo himself. The Cowboys rushing attack ranked 18th in the league with 1,807 yards and the five rushing touchdowns tied for 30th in the league. Romo and the Cowboys have not had a 1,000-yard rusher on the team since Julius Jones in the 2006 campaign, the season Romo took over as a starter. Romo has thus not played with a 1,000-yard rusher for the last 5 seasons. Tony Romo accounted for 32 of the 39 total touchdowns the Cowboys scored in the 2011 NFL season (DeMarco Murray had two touchdowns while Felix Jones, Jon Kitna, Phillip Tanner, Stephen McGee and defensive back Terrence Newman each had one). Romo contributed to 82% of the team's total touchdowns for 2011, no other player in the 2011 regular season contributed a higher percentage of team touchdowns (Cam Newton: 72.9%, Matthew Stafford: 71.9%, Drew Brees: 71.2%, Tom Brady: 68.8%, Aaron Rodgers: 68.5% and Eli Manning: 63.8%). In Week 13 against the Philadelphia Eagles, Romo threw 3 touchdown passes. The first pass, a 23-yard throw to Dez Bryant with 11:18 left in the third quarter, gave Romo 166 career touchdown passes, surpassing the previous franchise record of 165 which had been held by Troy Aikman. Topping a three-game winning streak and winning its fifth out of six games, Dallas beat the Pittsburgh Steelers 27-24 in overtime in Week 15 (December 16). The win put Dallas in a three-way tie with New York and Washington in the NFC East. Romo surpassed 25,000 passing yards in this game with 30-for-42 passing for 341 yards and two touchdowns. However, Dallas would finish 2012 with an 8-8 record and fail to make the playoffs for the third straight season after losing the last two games. On Week 16 (December 23), despite Romo making 4 touchdown passes and 416 passing yards (on 26-for-43 passing), Dallas lost to New Orleans Saints 37-34 in overtime. Following that game, Dallas and the Washington Redskins had a two-way tie of 8-6 records atop the NFC East. Those teams would face each other in Week 17, and the winner would take the NFC East title. Dallas lost that crucial game 28-18 to Washington. With overall 20-for-37 passing, Romo threw a total of three interceptions, including on Dallas' first two drives. With 5:50 left and down 21-10, Romo made a touchdown pass to Kevin Ogletree and two-point conversion pass to Dwayne Harris. After Dallas took over with 3:33 left down 21-18, Romo threw an interception to Redskins linebacker Rob Jackson, and Washington would clinch the victory with a touchdown. Following the season, the future of Romo's career has been called into question. Mac Engel of the Fort Worth Star-Telegram commented: "Tony Romo has one year remaining on his contract, but the time has come for him to move on...He will be 33 in April of '13, and still has a few good years left but at this point he needs to go to another team that needs a quarterback." In a Fox Sports Southwest interview, Rick Gosselin of The Dallas Morning News also called Romo "not wired to win the last game of the season" especially "[i]f it means extending the season." Dan Graziano of ESPNDallas.com wrote that Romo's "record starts to become very hard to defend" due to "the oft-cited fact that he's got just the one playoff win in his entire career." The Cowboys gave Romo a 6-year extension worth $108 million, with 55 million guaranteed and $25 million in bonuses, thus securing him for the rest of his career and also relieving the pressure from the salary cap, which was reported to have less than $25,000 in cap space before the deal was struck. In the middle of April 2013, he underwent back surgery to remove a cyst. Although it was characterized as a minor procedure by the team, he would end up missing all of the Mini-camp and Organized Team Activities. Romo opened the season with a win over the Giants, passing for 263 yards and two touchdowns. He briefly left the game with a rib injury, but returned after halftime to finish the game. After Week 7, his 100th career start, Romo had thrown for 27,485 yards, the most by a quarterback in his first 100 starts since 1960. In the fifteenth game of the season playing against the Washington Redskins, with the Cowboys trailing in the fourth quarter and needing to win to keep its playoff hopes alive, he led the team to a touchdown drive with 1:08 minutes remaining in a 24-23 victory, with what was later diagnosed as a season-ending herniated disk injury. Head coach Jason Garrett would later say: "He might have had his finest hour … We talk about mental toughness, being your best, regardless of circumstances. Somehow, some way, he helped us win that ballgame.". Romo underwent back surgery on December 27, 2013 and was placed on the Cowboys' injured reserve list. Garrett announced that Kyle Orton would be the starting quarterback for the Week 17 game against the Philadelphia Eagles, which the team would eventually lose 24-22 and miss the playoffs for a fourth straight year. After a poor performance in the season opener versus the San Francisco 49ers, Romo and the Cowboys won six consecutive games, including back-to-back road games against the Tennessee Titans and the St. Louis Rams. The Cowboys also defeated the defending champion Seattle Seahawks on the road, becoming only the second team to win a road game against the Seahawks in the last three seasons. Through those six wins, Romo threw a 13:3 touchdown:interception ratio. In Week 8, in a Monday night game against the Washington Redskins, Romo went down with a back injury when linebacker Keenan Robinson sacked Romo with his knee going into Romo's back. After the loss to Washington, it was revealed that Romo had two fractures in his transverse process. He missed the next game, a 28–17 loss to the Arizona Cardinals, but came back the next week and went on to lead the Cowboys to a 12–4 record and their first divisional title since 2009. On December 21, Romo set the Dallas Cowboys record for highest completion percentage in a game with 90%, completing 18 of his 20 passes in a 42-7 blowout win over the Indianapolis Colts. He also set his personal best quarterback rating in a single game with 151.7. In the wild card round of the playoffs, Romo led the Cowboys to a 24–20 comeback victory over the Detroit Lions after being down 17–7 at halftime. Romo was 19-31 for 293 yards with two touchdowns and no interceptions. In the divisional round of the playoffs, Romo and the Cowboys were defeated by the Green Bay Packers, 26–21. Romo was 15-19 for 191 yards with two touchdowns and no interceptions. Romo returned to the starting lineup in a week 11 game against the Miami Dolphins. Despite throwing two interceptions, Romo completed 18 of 28 passes for 227 yards and two touchdowns in a 24-14 victory, ending the Cowboys' seven-game losing streak. The Cowboys then faced the 10-0 Carolina Panthers in a week 12 Thanksgiving game. Although up against an undefeated team with a 3-7 record, the Romo-led Cowboys were favored to win. However, Romo threw three interceptions in the first half, two of which were returned for touchdowns, helping the Panthers take a 23-3 lead. At the end of the third quarter, Romo was sacked by linebacker Thomas Davis, reinjuring his left shoulder and ending his season. Romo remained on the active roster until December 21 when he was placed on injured reserve after the Cowboys dropped to 4-10, officially ending their playoff hopes. Romo was unable to start in the 2016 regular season after suffering a compression fracture to the L1 vertebra in his back during the Cowboys' third preseason game against the Seattle Seahawks. The injury caused Romo to miss the first 10 games of the season, with the duties of the team's starting quarterback being assumed by rookie Dak Prescott. Although Cowboys owner Jerry Jones initially said Romo would remain the team's starter when he returned, Prescott's success with the team and the length of Romo's injury led to Jones reconsidering his decision. Amid Prescott guiding the team to an eight-game winning streak, Romo conceded his role as starting quarterback to Prescott and began serving as the Cowboys' backup when he returned to the active roster in week 11. On Dec 21, 2014, Romo completed a team record 90.0% of his passes (18 of 20) in a home game against the Indianapolis Colts. As of 2013 Romo has hosted a youth football camp in Burlington, Wisconsin, annually during the summer, since 2004. In the Dallas area, Romo has participated in community activities in collaboration with United Way, the Make-A-Wish Foundation, and the Society for the Prevention of Cruelty to Animals. In September 2008, Romo signed a 5-year, $10 million endorsement deal with apparel marketer Starter. On July 13, 2009, People reported that Tony Romo and Jessica Simpson had broken up on July 9, 2009—the night before her 29th birthday. Romo's grandfather, Ramiro Romo Sr., emigrated from Múzquiz, Coahuila, Mexico, to San Antonio, Texas as an adolescent. The elder Romo cites Tony's success as an example of the possibilities afforded to immigrants in the United States: "I've always said this is a country of opportunities. If you don't get a job or an education, it's because you don't want to." Romo is a "Navy brat": he was born while his father Ramiro Romo, Jr. was stationed at the San Diego U.S. Naval Base. The Romos later returned to Burlington, Wisconsin, where Ramiro would become a carpenter and construction worker and his wife Joan would be a grocery-store clerk. In September 2007, Ramiro Romo Jr. was diagnosed with prostate cancer. Tony Romo has stated that, while upset about the family crisis, he still must continue to focus on his career. On May 28, 2011 Romo married Candice Crawford, the 2008 Miss Missouri USA, a former journalist for Dallas television station KDAF, and the sister of actor Chace Crawford. They dated since the summer of 2009 and became engaged on December 16, 2010. Their first son Hawkins Crawford Romo was born on April 9, 2012  and their second, Rivers Romo, was born on March 18, 2014. Romo is a Christian. Romo has spoken about his faith saying, "My faith has grown and I found that always having Jesus makes things a lot easier in my life. Having Jesus in your life gives you everlasting peace, which never goes away. It helps you handle the ups and downs of professional football." 1 2 Watkins, Calvin. "Dallas Cowboys' Romo has Support of Jerry Jones, Phillips". Archived from the original on July 30, 2010. Retrieved January 6, 2009. ↑ Kostora, Nick (November 15, 2012). "10 Biggest Choke Artists in the NFL". Retrieved September 1, 2016. ↑ Iyer, Vinnie (August 12, 2013). "Jason Garrett defends Tony Romo's playoff record with Cowboys". Retrieved September 1, 2016. ↑ King, Peter (December 11, 2014). "Is Romo Small in Big Games?". Retrieved September 1, 2016. ↑ Brinson, Will (January 2, 2015). "Tony Romo looks to end playoff demons Sunday in Cowboys-Lions". Retrieved September 1, 2016. ↑ "Tony Romo is 4th quarter clutch". nfl.com. October 12, 2013. Retrieved August 28, 2016. ↑ Peter Jackel (June 23, 2008). "JACKEL: Romo stays true to roots". The Journal Times. Racine, Wisconsin. Retrieved August 28, 2016. 1 2 Simek, Peter (August 22, 2012). "Tony Romo: The Natural (part 2)". D Magazine. Retrieved January 3, 2013. ↑ "Rolly Bauman's History of the Burlington Little League". Burlingtonhistory.org. Retrieved March 15, 2009. 1 2 "Wall of Fame: Class of 2008". Burlington Area School District. Retrieved January 3, 2013. 1 2 3 4 5 6 "Tony Romo". Dallas Cowboys. Retrieved October 29, 2012. ↑ "Ricks/Romo Honored; EIU Moves Up In I-AA Polls". Eastern Illinois University. Archived from the original on November 13, 2002. ↑ "Mason's Morsels". Blog.denverbroncos.com. Archived from the original on March 7, 2008. Retrieved November 28, 2008. ↑ "NFL Game Center: Post Game – Houston Texans at Dallas Cowboys – 2006 Week 6". NFL.com. Retrieved November 28, 2008. ↑ "NFL Game Center: Box Score – Tampa Bay Buccaneers at Dallas Cowboys". NFL.com. Retrieved November 28, 2008. ↑ "Dallas Cowboys at Seattle Seahawks, Saturday, January 6, 2007". Pro-Football-Reference.com. ↑ "Sources: Cowboys, Romo agree on 6-year, $67.5 million deal". ESPN. ↑ "Romo throws for 320 yards, Dallas defense controls Cleveland". espn.com. Associated Press. September 7, 2008. Retrieved January 3, 2013. ↑ "NFL makes McGinest pay for hit on Romo". Dallas Cowboys and the NFL. MySanAntonio.com. September 11, 2008. Retrieved January 3, 2013. ↑ "T.O. moves into 2nd on TD receptions list as Cowboys win shootout with Eagles". ESPN.com. Associated Press. September 15, 2008. Retrieved January 3, 2013. ↑ "Eagles Trounce Cowboys to Cap Unlikely Rally to NFC Wild-Card Berth". Retrieved January 6, 2009. ↑ "NFL.com Game Center: Box Score – Dallas Cowboys vs. Philadelphia Eagles". Retrieved January 6, 2009. ↑ Purs, Scott (September 14, 2009). "Buccaneers struggle with big plays in Dallas Cowboys' win". The Dallas Morning News. Archived from the original on October 25, 2009. ↑ Archer, Todd (September 21, 2009). "Dallas Cowboys' Romo expects to learn from errors". Dallas Morning News. Archived from the original on October 26, 2009. ↑ "Dallas Cowboys' Romo to resume role as holder". SportsDayDFW.com. December 10, 2009. Retrieved August 28, 2016. ↑ "Cowboys Lose Romo to Fractured Left Clavicle". The Washington Post. October 25, 2010. Retrieved October 25, 2010. ↑ Eatman, Nick. "Romo Wins Offensive Player of Week Honor". True Blue Fan Club. DallasCowboys.com. Retrieved 6 June 2012. ↑ MacMahon, Tim. "Miles Austin owns up to mistake on would-be TD". ESPNDallas.com. ESPNDallas.com. Retrieved 7 June 2012. ↑ Jeremiah, Daniel. "Cam Newton's ranking among NFL QBs brings varied opinions". NFL.com. NFL.com. Retrieved 6 June 2012. ↑ Archer, Todd. "Tony Romo passes Troy Aikman, sets Dallas Cowboys' TD passes mark". ESPNDallas.com. ESPN.com. Retrieved 3 December 2012. ↑ Kay, Joe (December 10, 2012). "Numb Cowboys beat Bengals 20-19 on last-second FG". Associated Press. Retrieved December 17, 2012. ↑ "Cowboys in tie for 1st in East thanks to overtime win over Pittsburgh Steelers". Dallas Morning News. December 16, 2012. Retrieved January 3, 2013. ↑ "Cowboys fall in OT, but still control playoff fate". ESPN. December 23, 2012. Retrieved January 3, 2013. ↑ Kilgore, Adam (December 31, 2012). "For Tony Romo and Cowboys, another season ends in frustration". The Washington Post. Retrieved January 3, 2013. ↑ Engel, Mac (December 31, 2012). "Tony Romo should look elsewhere & other genius observations". The Big Mac Blog. star-telegram.com. Retrieved January 3, 2013. ↑ "Gosselin: I just don't think Tony Romo is 'wired for the big game'". Dallas Morning News. January 1, 2013. Retrieved January 3, 2013. ↑ Graziano, Dan (December 31, 2012). "Tony Romo has himself to blame". Dallas Cowboys Report. ESPN.com. Retrieved January 3, 2013. ↑ Marc Sessler (March 29, 2013). "Tony Romo signs $108M contract with Dallas Cowboys". Around the NFL. nfl.com. Retrieved August 28, 2016. ↑ "Mind-blowing stats for Week 8 of the 2013 season". National Football League. October 23, 2013. Retrieved October 23, 2013. ↑ Kavner, Rowan. "Tony Romo Out For Rest Of Year After Back Surgery". DallasCowboys.com. Dallas Cowboys. Retrieved 27 December 2013. ↑ "Cowboys vs. Seahawks – Box Score – October 12, 2014 – ESPN". espn.go.com. Retrieved November 27, 2015. ↑ "Top 100 Players of 2015: No. 34 Tony Romo" (video). nfl.com. Retrieved August 28, 2016. ↑ Archer, Todd (September 21, 2015). "Tony Romo fractures collarbone, set for more tests Monday". ESPN.com. Retrieved October 1, 2015. ↑ Hoffman, Benjamin (September 20, 2015). "Tony Romo Breaks Clavicle, Leaving Dallas Cowboys Fans on Edge". The New York Times. Retrieved October 1, 2015. ↑ Helman, David (September 21, 2015). "Romo Won't Need Surgery On Shoulder Expected To Miss Eight Weeks". DallasCowboys.com. Retrieved October 1, 2015. ↑ Conor Orr (November 27, 2015). "Tony Romo out for rest of season with clavicle fracture". nfl.com. Retrieved November 27, 2015. ↑ Archer, Todd (December 25, 2015). "Out of playoff contention, Cowboys put Tony Romo on IR". ESPN.com. ↑ "Tony Romo breaks bone in back, out until mid-season". nfl.com. Retrieved August 27, 2016. ↑ "Cowboys insist Tony Romo will be the starter again soon no matter how well Dak Prescott is playing". SB Nation. Retrieved November 26, 2016. ↑ "Jerry Jones is no longer committing to Tony Romo as the Cowboys starter". CBS Sports. Retrieved November 26, 2016. ↑ "Tony Romo Concedes Cowboys' Starting Job to Dak Prescott". The New York Times. Retrieved November 26, 2016. ↑ Jackel, Peter (June 23, 2010). "Romo teaches campers more than X's and O's". Racine Journal-Times. Retrieved January 4, 2013. ↑ "Cowboys star Tony Romo returns home for annual camp". 27 June 2013. Retrieved 25 September 2013. ↑ "Cowboys QB Tony Romo signs apparel endorsement deal". star-telegram.com. Retrieved July 31, 2010. ↑ "Jessica Simpson Brings Tony Romo Home For Thanksgiving". Omg.yahoo.com. November 26, 2007. Archived from the original on August 30, 2008. Retrieved November 28, 2008. ↑ "All Eyes on Jessica Simpson at Cowboys Game". people.com. December 17, 2007. Retrieved August 28, 2016. ↑ Garcia, Jennifer (January 7, 2008). "Jessica Simpson and Tony Romo's Romantic Getaway". People Magazine. Retrieved November 28, 2008. ↑ David Flores (November 2, 2006). "Romo's grandparents revel in his first game as Cowboys' starting QB". San Antonio Express-News. Archived from the original on November 10, 2006. Retrieved November 29, 2006. ↑ "Romo's father diagnosed with prostate cancer". ESPN.com. Associated Press. October 12, 2007. Retrieved January 4, 2013. ↑ "Tony Romo, Candice Crawford Wed in Dallas". people.com. May 29, 2011. ↑ "Candice Crawford Received a VERY Special Birthday Present Today...". The 33 News. KDAF. December 16, 2010. Archived from the original on July 24, 2011. ↑ "Tony Romo and Candice Crawford Welcome Son Hawkins". People. April 10, 2012. Retrieved April 10, 2012. ↑ Sarah Michaud (March 18, 2014). "Tony Romo Welcomes Son Rivers". People. Retrieved March 18, 2014. ↑ "Bright Star In Big D".